Willem Volkersz came to the United States from his native Holland in 1953. While attending Garfield High School in Seattle, he bought a 4"x5" Crown Graphic camera and set up a photography business; he also worked for an interior design firm. On motor scooter and car trips along the West Coast, he became enamored with American popular culture. Over time, he documented 1000's of billboards and neon signs, examples of eccentric vernacular architecture and folk art environments. He began to collect paint-by-number paintings, postcards and kitschy travel souvenirs which eventually became part of the visual vocabulary with which he tells the stories of his boyhood, emigration, travel and life in the West. The artist's work has been featured in 50 solo exhibitions and more than 200 group shows in the US, Canada, England, Scotland, China and Taiwan. His work is in numerous corporate, museum and private collections. He has taught at Ohio State University, Jacob Kramer College, the Kansas City Art Institute and Montana State University, where he also served as Director of the School of Art for six years. 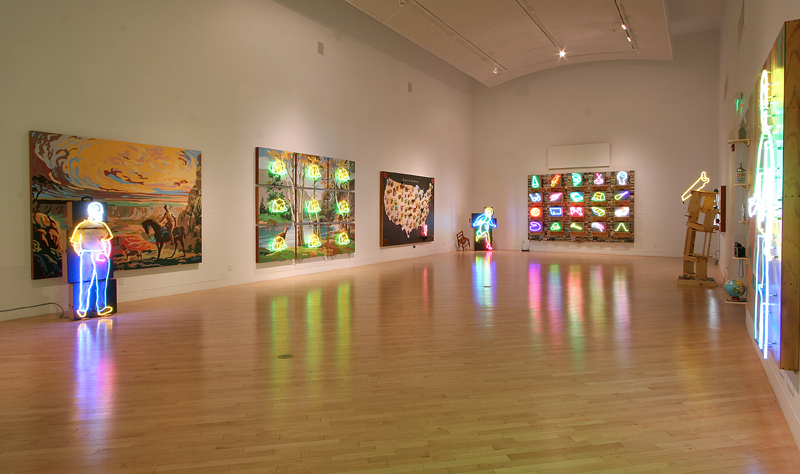 Domestic Neon was selected as the featured exhibition for 3rd, 4th, or 5th graders for their annual gallery visit in Bozeman, Missoula and Helena in recent years. The artist especially enjoys doing guided tours for students of this age. The artist and his wife have traveled extensively to collect and document American folk and outsider art. Work from their collection has been loaned to many museums and has traveled throughout the US (Word and Image in American Folk Art , and The Radiant Object . The collection has now found a new permanent home at the John Michael Kohler Arts Center (Sheboygan, Wisconsin) and the Missoula Art Museum (Missoula, Montana). IN MEMORIAM The installation In Memoriam has found a permanent home at the National Holocaust Museum in Amsterdam. School groups and the public can re-install the 172 wooden uitcases and look up victims' personal history and photos on a computer. Copyright 2013 Willem Volkersz.com. All rights reserved.